Days are getting longer, the sun is shining just that little bit warmer, and the happy daffodils are starting to rear their heads into the bright Spring sunshine…Summer is on its way and so are those warm nights where sitting around a campfire watching the stars, with only your loved ones and the trees for company is just the ticket. 1 Hassle-free holidays – say goodbye to traditional camping palavers! When you arrive at The Glamping Orchard, our number one priority is ensuring that you have to do as little as possible to settle in. Your accommodation will be set up and fully prepared with all the home comforts plus, some added little touches just to make your stay even more special. There will be no stressing about which pole goes where, or who forgot the tent pegs – simply roll up, check in, and relax. Belle, our cosy Bell Tent, is filled with beautiful rugs, cushions, linen, lighting and accessories and The Warwick Knight, has a retro charm, streaming with light through the numerous windows. In both, a homely wood burning stove will provide those perfect fire flickers and crackles, and ensure you’re warm and cosy in all weathers. Back to nature doesn’t have to mean back to basics; you don’t have to put up with a chilly sleeping bag and a roll mat in order to get a taste for the outdoors! Our stylish Bell Tent measures 3 metres high by 5 meters wide, making room for proper cosy beds and The Warwick Knight, has its very own sleeping area separated by a sliding door from the main living space, allowing privacy when the kids have turned in for the night. The double beds have plush mattresses, crisp sheets and fluffy duvets, ready for you to snuggle up warm and cosy, the flicker of a candle flame creating the mood, and the log burner gently lulling you off to sleep as it burns down for the evening. 3. Reconnect as a family – play, laugh, love. Work, commutes, home, school – life is busy, and in amongst the stresses of the daily routine, it can be easy to forget to take time for each other and appreciate what it means to be a family. 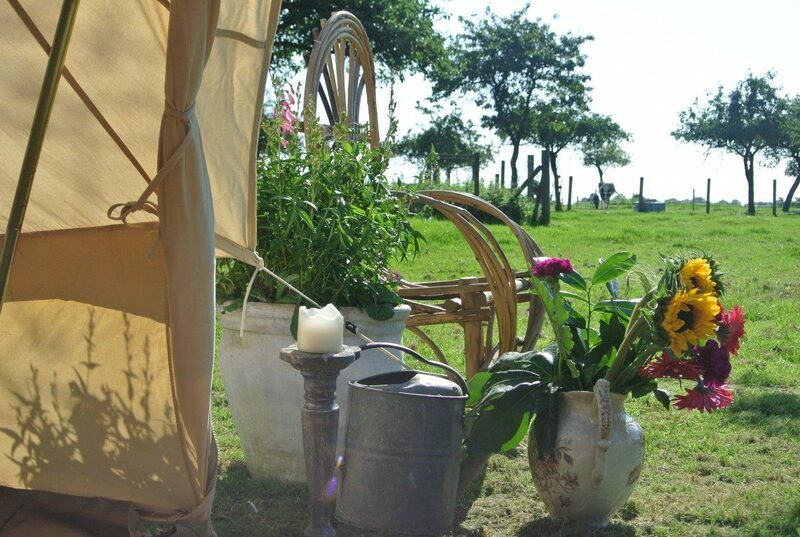 Here at The Glamping Orchard, you’re surrounded by countryside on a small-holding in the heart of the Severn Vale – it’s the perfect space to stop and be together! Come and explore the orchard, run until you’re out of breath, kick a ball, say hello to the chickens, collect eggs, and just sit in silence whilst you breathe in the fresh air. Enjoy the experience of cooking over an open fire and eat dinner as a family whilst conversing about farm animals and watching the stars. In the evening, chill out with hot cocoa and play family games such as Uno and Scrabble beside the fire pit. Light candles, bask in the heat of the fire, swap stories, and enjoy each other’s laughter. Spending the night in The Warwick Knight or Belle is a magical and memorable experience for the whole family. You’ll hear nothing but the sounds of the countryside and the wind blowing gently in the trees as you drift off for a good nights sleep. Outside your accommodation, you’ll have your own set of table and chairs. On a clear night this is the ideal space to sit with a warm mug of tea next to the fire pit, watching out for shooting stars, and spotting the constellations. A night under the stars will rejuvenate your soul, rest your body, and relax your mind. You’ll be surprised at how refreshed you feel when you wake up to the sound of bird song in the morning! 5. Experience life on a small-holding. Start your morning with a good morning neigh, moo, cluck, and an oink! Take the gravel path in the orchard and collect some eggs from our chickens or collect a basket filled of local produce for breakfast. Spend the morning exploring the surrounding orchards, running through the fields and making friends with our pig, lambs, horses and ponies. In the afternoon, take a short drive to a local market town, pick up some local produce, and stop off for a spot of lunch in one of the quaint cafes/pubs. Then on your return, light the wood burner and head to your private kitchen to make dinner. Eat around the fire and delight in family conversation. As the cold creeps in, wrap up in blankets, crack open a bag of marshmallows, and watch the stars light up the sky as the animals settle down for the night. 6. Go on, try something new! The Glamping Orchard enjoys a peaceful position in the middle the Severn Vale’s picturesque scenery, just a short walk from the River Severn. You can do as much or as little as you wish during your stay, it’s completely up to you. If you opt for a more adventurous holiday, there’s plenty to keep you and the kids occupied. Check out the local gardens and wildlife parks, have a go at horse riding, or venture to the Severn Bore where you can watch surfers tackle the famous wave! Chat to us to arrange for a horse and carriage ride through the lanes, take in the scenery and stop off at a local pub – it’s often the simple things that are the most enjoyable! 7. Bike, walk, or boat. It’s not every day that you get the chance to hire your own boat! Get the kids in pirate mode and set sail on a family adventure down the Sharpness Canal. Cruise from Slimbridge to the vibrant Gloucester Docks where you can wander around the old Victorian Docks full of warehouses and buildings that are alive with history. Stroll down to the River Severn for a lovely walk, or hire some bikes and ride them along the Sharpness Canal. Stop for a flask of tea, watch the boaters to-ing and fro-ing, and see the wildlife bring the water and river banks to life. Ramble through the lanes down to the river, pick berries, take in the sights, stop for a drink in one of the pubs, and capture these precious family moments in photographs. At The Slimbridge Wetland Reserve you’ll get the chance to get up close and personal with amazing wildlife, including birds, amphibians, and mammals. Let the kids learn about nature through hands on experiences and practical activities – it’s much more fun than learning from a textbook! When you’re finished with the creatures, pop on your wellingtons and splish, splash, splosh in Welly Boot Land! If you’re into your wildlife, then make sure that you visit the Cotswold Farm Park too. This family friendly farm park is better known as ‘Adams Farm’, made famous on the BBC’s Countryfile. Here you’ll be able to watch milking demonstrations, meet chicks, bottle feed the lambs, and take a farm safari on a tractor and trailer. For larger, more unusual animals, head on over to the Coltswold Wildlife Park. Watch the kids’ mouths drop as they watch the rhinos, lions, lemurs, giant tortoises and so many more exciting creatures roam the Park! 9. Discover culture, beauty and local history. Although it feels like we’re in the middle of nowhere, our little small-holding sits in a privileged position, with everything within easy reach. The renowned Cotswolds with rolling hills and stunning landscapes, are just waiting to be discovered. For a little culture, we highly recommend the nearby gardens and country houses at Painswick Rococo, Batsford Arboretum, Berkeley Castle, the Butterfly Sanctuary and Sudeley Castle and Gardens. These attractions are ideal if you’re planning on spending your days exploring gardens, art, architecture, and local history. For something more urban, drive to Gloucester or Bristol to enjoy the shops, attractions, and nightlife, or head South to Weston Super Mare for beach and pier fun. 10. Put your feet up and relax. After a busy (or not so busy!) day, retreat back to your private seating area, kick off your shoes, grab a book, sit back, and watch the sun set into the rolling hills of the Forest of Dean. Get the family together and enjoy a game of cards and eat dinner around the fire. When darkness starts to creep in, get the candles flickering, toast marshmallows, and crack open a bottle of local cider. After all, when you’re glamping in an orchard it would be rude not to, right? Don’t worry about remembering all of these suggestions – in Belle and The Warwick Knight you’ll find a book full of handy hints, helpful tips, and top places to visit. To check availability please click here or call 07974 174534 and speak to us about when you would like to stay.